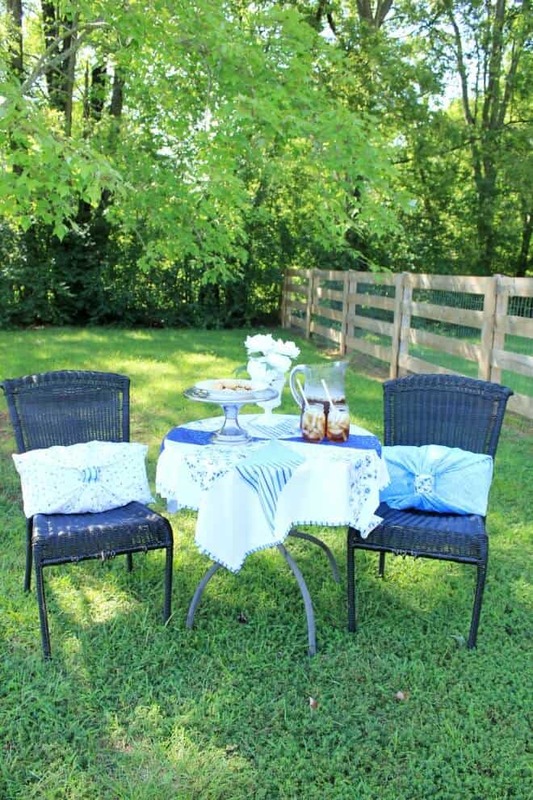 I still remember the days of growing up and pretending to be a southern belle, having tea parties out in the grass with finger sandwiches and pastries. It was all about big hats, shiny lipstick, and frilly dresses, but, my, how all that has changed! 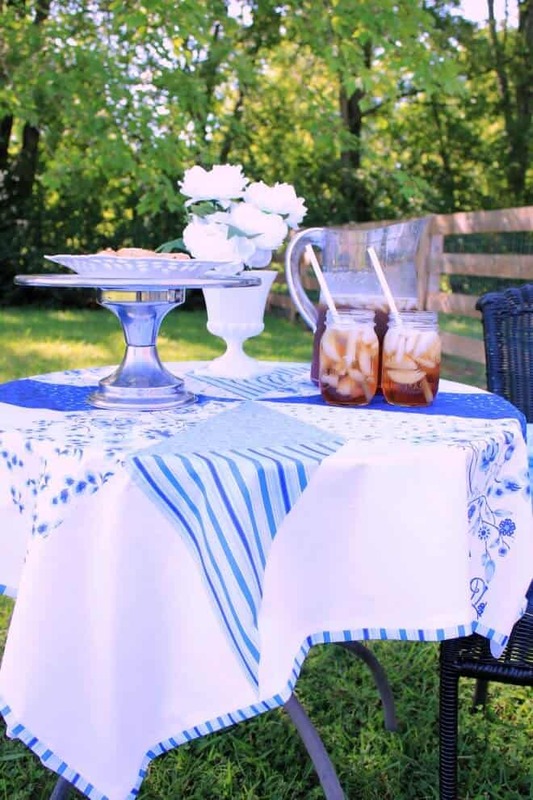 Since then, I have updated my tastes and style and recreated a grown up version of a Southern Sweet Tea party with fancy fabrics – all without sewing! I have a confession to make.This Kentucky girl didn’t start saying y’all until college. I grew up in Florence, KY, just south of Cincinnati. Even though my hometown is known for it’s FLORENCE Y’ALL water tower right off the interstate, surprisingly no one there really says y’all, so I never adopted that phrase. You see, my Daddy is from the city and my Momma is a farm girl. Like a no-plumbing-until-she-was-a-teenager kind of farm girl! And I was raised just south of the big city, so ‘Y’all’ was not what the too-cool-for-school kids said. Then I left for college in Tennessee and I was surrounded by that drawl and within the first week, ‘Y’all’ was rolling off my tongue as if it were a part of my vernacular all along ~ just like those days of the playtime tea parties. I’ve kept it ever since. When I received my happy mail from Karianne at Thistlewood Farms, that Sweet Tea fabric took me on a time warp back to those days of being a little girl, spouting out Southern colloquialisms with my pinky up, but now I’m a big girl, and sitting outside, swatting mosquitoes and sweating from all the humidity isn’t at the top of my list. I know the saying is, “Southern Girls don’t sweat, they Glisten,” but my body didn’t get the memo. So, I wanted to recreate that dreamy escape, but without the hot tea. It has to be ice cold Southern Sweet Tea. ACK! I mean, I like it and can do it and I love how it turns out. And I enjoy that I can complete simple projects, but sewing just isn’t my jam. It doesn’t make my heart sing and kinda makes me a little nervous when things go wrong…which happens to me a lot. Although I got out my machine to sew my Farmhouse Apron, and stitched together my Embroidered Coffee Cozy, I wanted to be true to myself and represent for my no sew crew. If you could see me now, I’d be throwing up a mad seam ripper gang symbol! 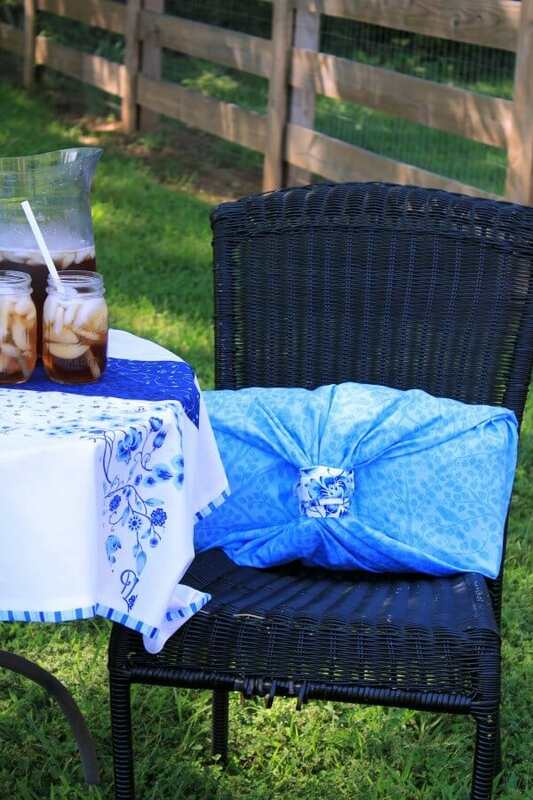 When I started creating this vignette, I started dusting off my sewing machine to use, but thought, I should show you how you can create a fun space with fabric even if you don’t have any sewing skills. This stuff saves the day every time. Just fold the edges you want seamed and iron, then add the tape between the fabric, and iron again! Easy peasy! 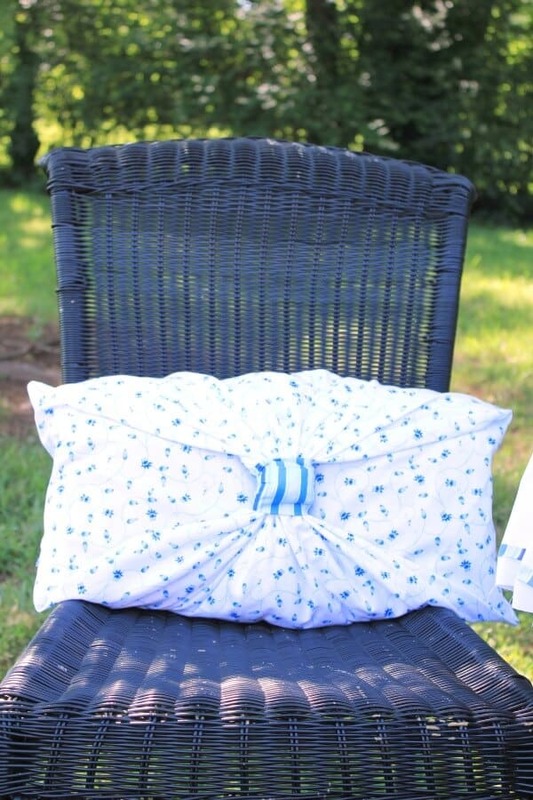 For the pillows, I searched on Pinterest and found some awesome no-sew pillow cover tutorials like this one from Michelle and this one from Monique. Using coordinating fabrics from the Sweet Tea Fabric line, and the tutorials from above, it’s all knots and bows, my friends! I was able to create a beautiful, tea party escape from all my stinky boys in less than 30 minutes! It was so much fun! First, let me tell you a little bit about my family and Sweet Tea. It’s a staple in our home and fresh pitcher is made every single day. And did I tell you we were a bit snobbish about our Sweet Tea? 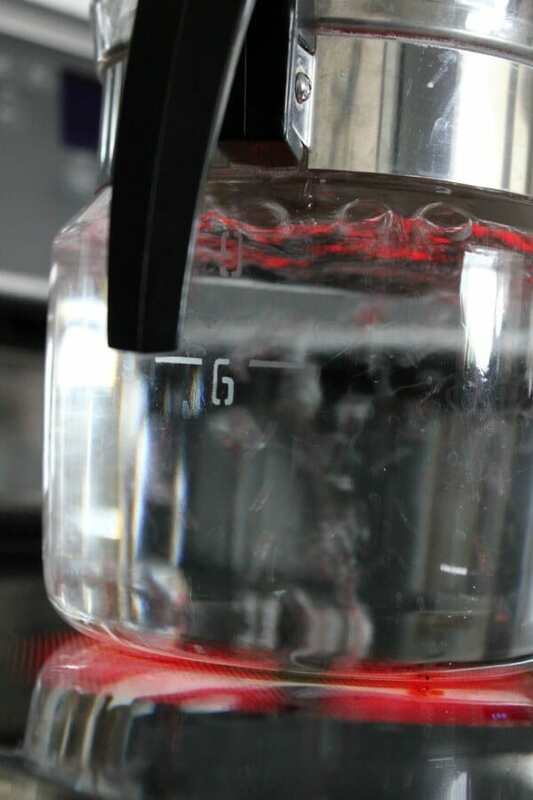 It’s really sweet, it’s not sun tea, or fruit tea, and it’s definitely not instant! 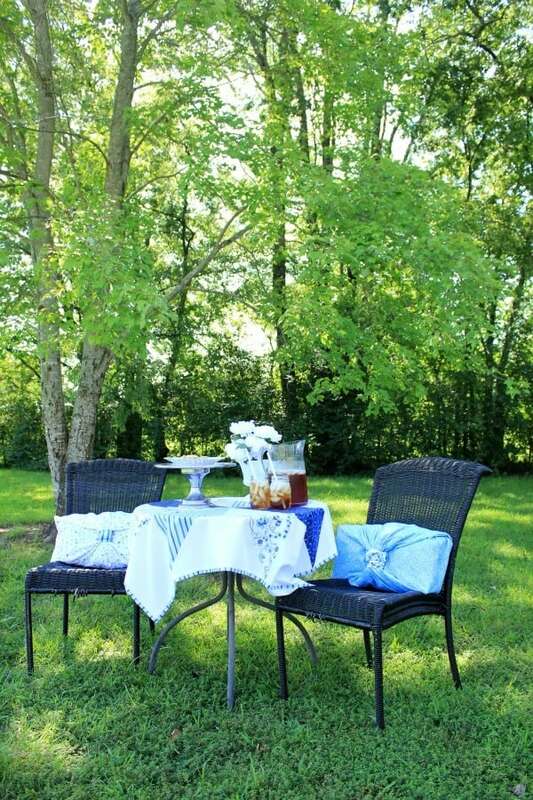 Now a few might argue about a few of our requirements, but like I said, we’re professed sweet tea snobs. 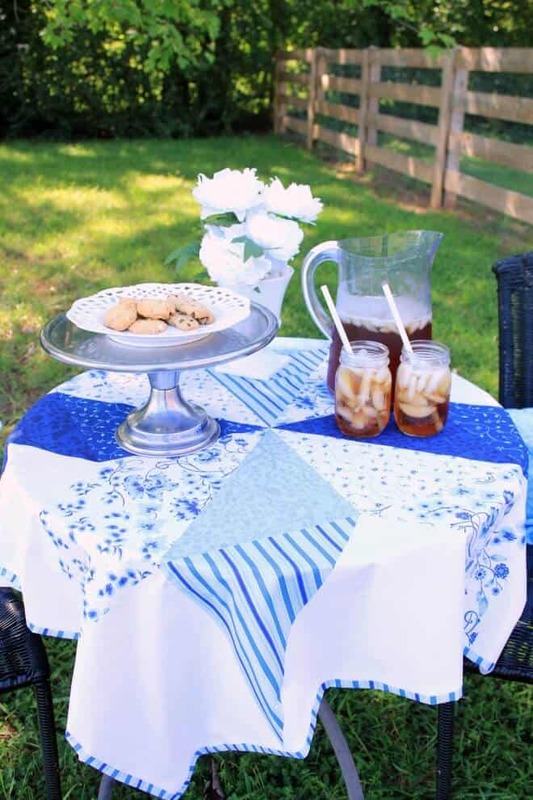 The other day, a friend asked me how to make real Southern sweet tea. I thought it would be fun to share my recipe with you. 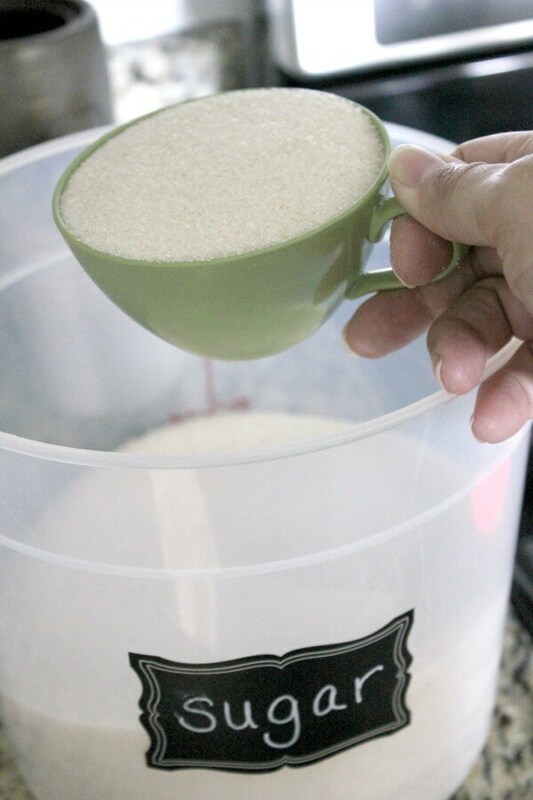 Trent’s momma had to school me on the proper technique of making sweet tea for my ‘Sweet T’, so, I thought I’d share the method I was taught with you all! 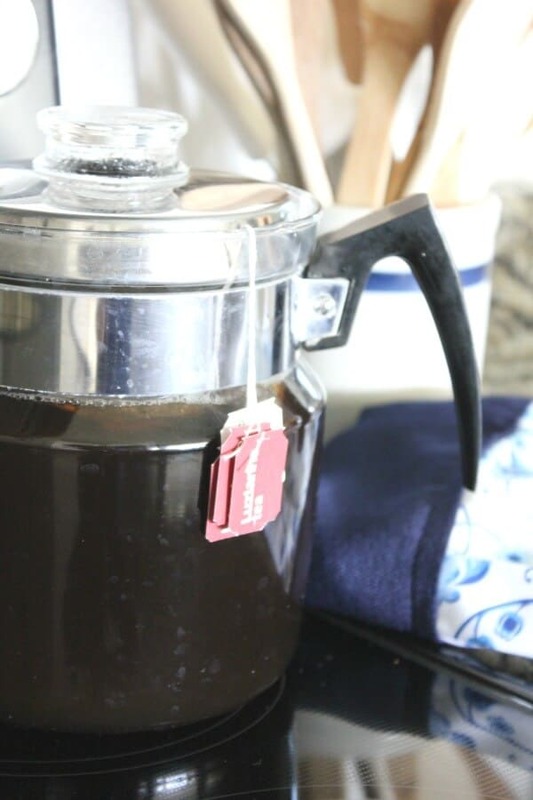 I use a vintage glass percolator that I found at a garage sale to brew my tea. 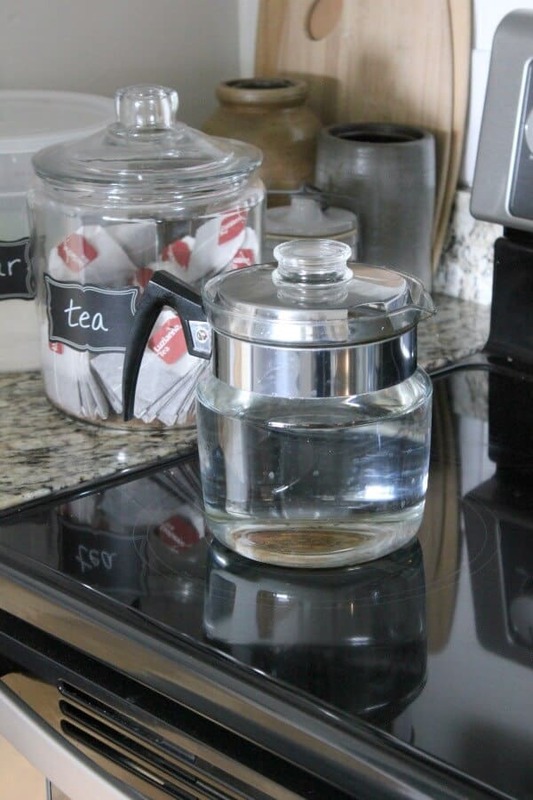 I just removed the coffee making parts and use the glass pitcher, but you can use an old pot like Trent’s momma did. Remind me to tell you all about that sometime! First, bring the water to a rolling boil. 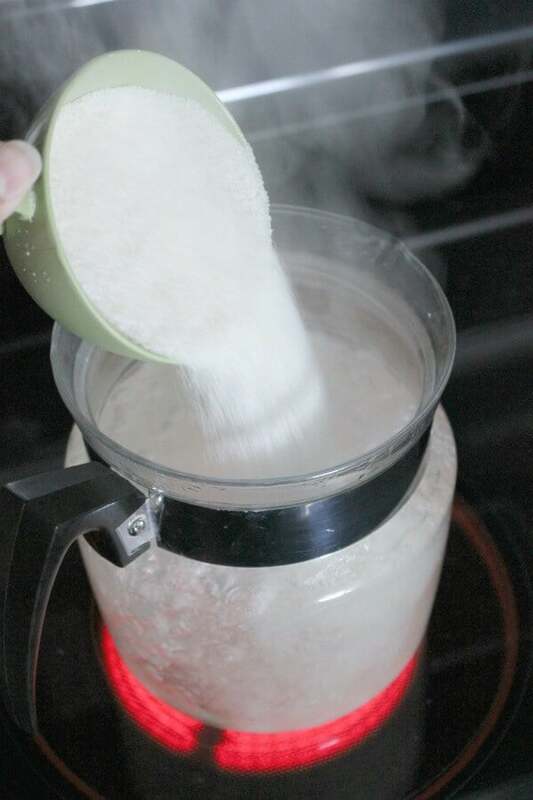 Allow the sugar to fully dissolve in the boiling water and then remove from heat. Add the tea bags and let steep for between 2 to 4 hours depending on how strong you like your tea. Or you can be like me, leave to run errands and forget to pour up the tea for 8 hours. Shh… it still tasted fine! 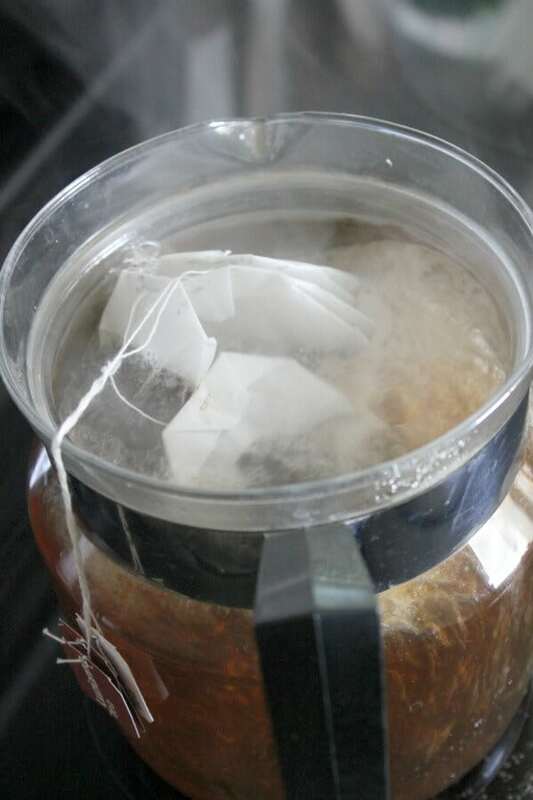 After the tea has steeped, remove the tea bags, pour into a gallon pitcher. I let it cool in the fridge for a few hours before serving. If you want to save this recipe for later, here’s a fun pinnable image for you! 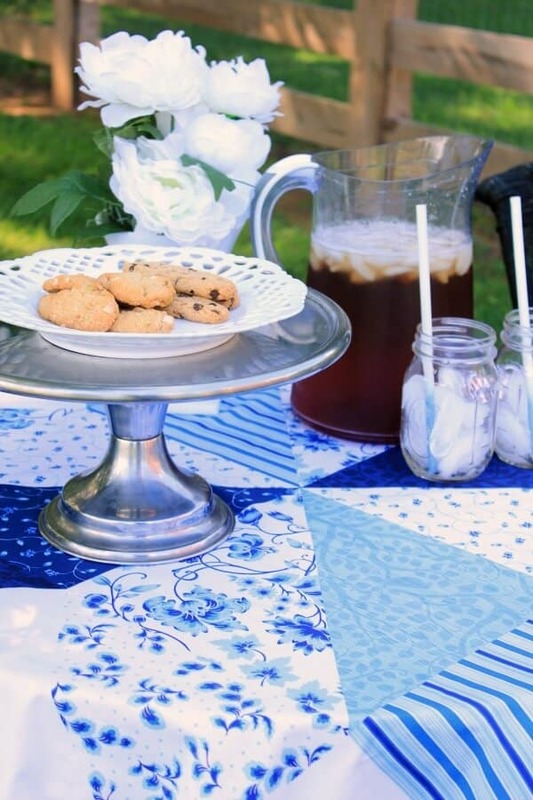 I certainly enjoyed being a Sweet Tea ambassador and have equally loved stretching my creative muscles to find unique ways to work with this awesome fabric. Above all, I hope you have enjoyed what I’ve shared. Finally, I just want to extend a gracious thank you to Hoffman Fabrics and Karianne for finding me worthy to be a representative. Be sure to head over to Jill’s from Sew a Fine Seam and Alli’s from Woodberry Way to find out what the other Sweet Tea Ambassador’s created. Well I have to tell you I don't have any sewing skills like this. Looks awesome and I love this fabric line, it's just fresh and fun. 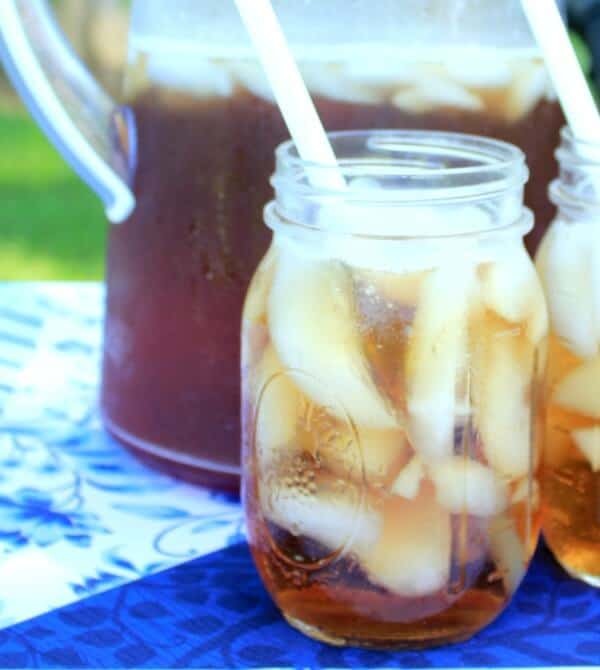 Living in Texas we love our sweet tea too – this summer instead of sugar I tried it with honey. Fantastic! Y'all need to try it. 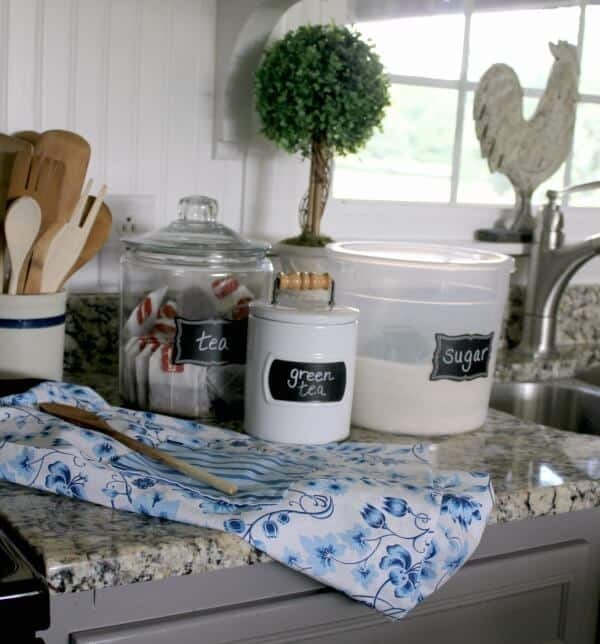 Love everything about this vignette especially the blue and white. And you cannot go wrong with sweet tea!